A brand new potstill has hit the local brandy scene. 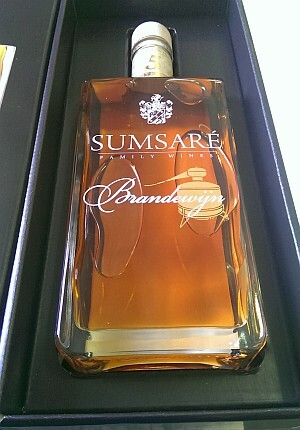 Sumsaré Wines has recently released their 5 year old Potketel Brandewijn. Hailing from historically significant Robertson, we caught up with 6th generation farmer and brandy maker Danie Erasmus about the new arrival. B&G: I see on your website, you have been making mampoer and witblits for some time on the farm, why now have you decided to release a brandy? DE: I have been making all three for the last 5 years on the farm, the only difference being that Mampoer and Witblits do not need to be aged in wood barrels, as does Brandy. So the brandy has been sitting quietly maturing in the cellar and is finally ready to be bottled. B&G: The grapes used for your brandy were all grown in Robertson. What is it about the terroir that makes this a good brandy grape growing area? DE: The secret lies in the lime rich soil and very warm climate which are perfect for the best brandy grapes. Back in the day palomino grapes used to be grown here exclusively for brandy, but they were replaced with Colombar. At one point in time, Robertson was the biggest distilling area in the world! B&G: How many bottles of the brandy have you released? DE: We are producing around 600 litres a year, matured in smaller 100 litre oak barrels. For this initial release we have bottled only 200 bottles. B&G: So what’s the plan for future releases? Will we see a 10 year old coming? DE: Its all dependent on how the market receives this first batch. If we sell out of the 5 year old, we can bottle some more to satisfy demand. If not, we’ll keep it in barrel for a 7 year old? We’ll see how it goes to see what we release going forward. B&G: Did you blend barrels, or bottle single casks? DE: We blended and bottled 2 barrels with very similar flavour profiles for this first bottling. B&G: It seems pretty dark for a 5 year old, a really aged tone to it. Tell me a bit more about your barrels? DE: We had barrels specially re-purposed for our brandy. 225 litre barrels refurbished and cut down to be 100 litre volumes. They were only lightly toasted, but the smaller barrel means a lot more surface area of the brandy is in contact with the wood. B&G: One famous Robertson brandy story would have to be that of Kosie Marais and the Klipdrift farm. Did your family ever have any interaction with the Marais family, back in the day? DE: Not as far as I know! We have been on the farm here for 203 years, one of the first families in the area. Am sure the paths must have crossed, but there is no real history there. B&G: When it comes to SA brandy, which other local potstill’s do you enjoy? DE: Just my own! When you make brandy yourself, you just don’t want to drink any other! B&G: Where did you learn to make brandy? DE: My father taught me the basics, and the rest I taught myself. My grandfather used to make brandy on the farm a long time ago, and my father remembered watching him do it as a young boy. When my dad was 75, he asked me to try it again and taught me what he knew. There had been restrictions in legislation prohibiting private distilling for many many years, and since these had been relaxed, we decided to give it a go. I sourced a potstill locally and applied for a private distilling license. After the initial produce came out well, we started the commercial application and are where we are today with our first 5 year old in the bottle! B&G: Thanks for your Time Danie, its been really good to chat. One last question before i tried the brandy…what should I look out for in terms of aroma’s and tastes? DE: Probeer dit vir jouself! Ek se eerder niks! Shortly after the interview, I opened the bottle generously donated by the family to me. And what a treat it was. 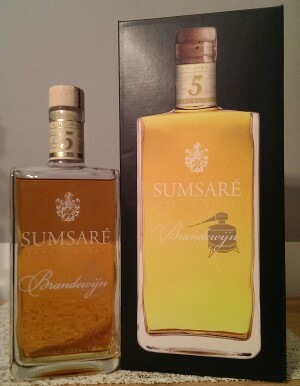 You can read my formal review on the Sumsaré 5 year old brandy in the tasting room, but this really is a micro crafted brandy that is mature beyond its years. A very high scoring potstill in my book, and a must have in any brandy collectors cabinet. Brandy retails for R375 a bottle, available directly from the farm. We did a tour of Klipdrift on our recent visit to Robertson enroute to Bushmans Kloof Wilderness Reserve in the Cederberg Mountains. We were told by the tour guide at Kliftdrift that the best locally produced brandy is your brand and that we could find it at the local liquor store just down the road. We immediately made our way there and purchased a bottle of Samsure. We didn’t get to try it until we made our way to Knysna a week later. What a delightful brandy. It was smooth in texture and incredibly tasty. Well done on producing an exception brandy. When we are in the area again, we will definitely purchase a few more bottles ! We are really spite that we didn’t visit your wine farm. We visited so many but only on our last day in Robertson were we informed of your brandy and realise you had a farm. A visit to your farm is at the top of our list for the next time we visit the Robertson area. Hi Janine, I have forwarded on your request to the makers, am sure they will be in touch, and hope you can get the bottle before Christmas – your husband will be very happy I’m sure!